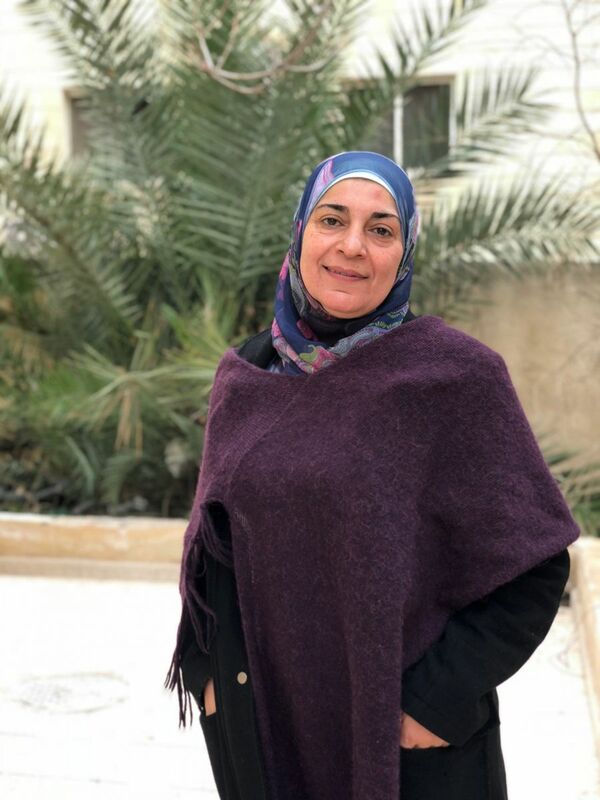 Back in Homs, my husband and I were both lawyers, and we came to Jordan around four years ago thinking that we would stay for a month or two until things settled down, and we could go back home safely. The thought of investing our money into a small business didn’t even occur to us, as the plan was to go back home at the first opportunity. The first year went by, so did the second and the third. Red lights started lighting up as our savings were running low, and we couldn’t sell any of our property back in Syria as the situation does not allow for that option. We ask our extended family and friends for help when absolutely necessary, but it was evident that we lost our life, and the standards that we lived by are no longer attainable, and everything has gone to waste. I spent the first three years in Jordan sitting at home, leaving only if absolutely necessary. My husband doesn’t work, which makes him really frustrated. Back in Syria, he had a very good position in a law firm, but he can’t work in Jordan as a lawyer as it isn’t one of the open sectors for refugees to work in. On top of that, he doesn’t have another skill that can help him earn money. This changed him entirely. What do you expect? I’m aware that most people with university degrees didn’t seek refuge in Jordan, but rather went elsewhere around the world. I was one of the few women who didn’t go to any international or local organization to seek help, as I was too afraid to face the society and the community, and because my savings weren’t all gone by then. I had never in my life received money without working hard to earn it. One day my friend told me to get up and go with her and have a look at what is happening at CARE. She said they were selecting women to become part of the Women Leadership Council, and that we should both try. When we were interviewed at CARE, I remember I was so excited because I felt like my voice was going somewhere, and that I am actually using the intellect that I worked hard for over the years to help people, like I always did. Now, I’m part of the Women Leadership Councils that CARE has organized. We work closely with women and teach them all kinds of things from literacy courses in English, gender-based violence awareness, to legal advice. We also work with teenage girls to raise awareness on issues like early and forced child marriage. I’m a mother of three, one son and two teenage daughters, so I know what most kids are going through nowadays, and I know that many of my daughters’ classmates are getting married at an early age; this is very alarming. We had many sessions about the issue of early and forced child marriage, and right after the first session, girls started asking us for more! More sessions, more information, and more reasons to why they shouldn’t get married at an early age, and how to use effective arguments to change the minds of their parents or caretakers. I felt that I was able to make a change in the mindset of the young girls, and that reminded me of what I’m capable of. I’m still the lawyer that had an impact back in Syria. I have gone through many things in life that made me more experienced, so when people come to me asking even the simplest of things, I feel great about myself. Feeling helpless is a horrid feeling. I reached a point where I was about to give up, but coming to CARE has helped me get rid of all the negative feelings and start over as a strong woman. To learn more about our work in Jordan, click here.